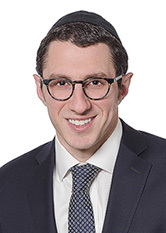 Michael M. Harary is an Associate in the Litigation & Alternative Dispute Resolution Group. He focuses his practice on commercial litigation, insurance litigation, and employment law. Mr. Harary represents clients in a range of commercial disputes including breach of contract actions, loan workout and foreclosure matters, director and officer litigation, and fraud and RICO litigation. Prior to joining the firm, Mr. Harary was a senior attorney at the New York City Office of the Comptroller where he analyzed high-profile § 50-h depositions and claims filed against New York City. While there, he also participated in multi-million dollar settlement negotiations for claims against the City. Mr. Harary is admitted in New York and New Jersey.